A NEW "Om Nom Drawing" (see above screenshot) has been added in the newly released ver. 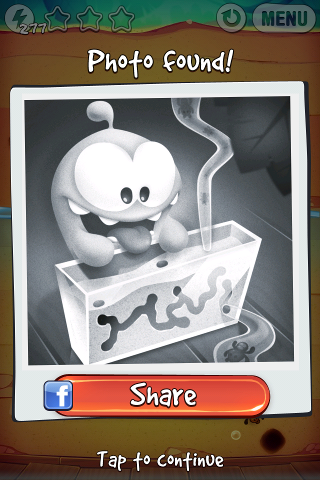 1.6 of "Cut The Rope: Experiments". An Android player "Litoness" said that for "Cut The Rope: Experiments", the drawing locations are the same for both iOS and Android platforms. 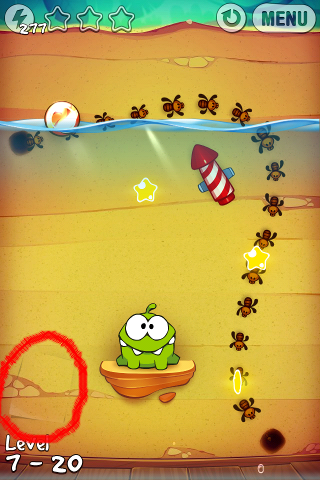 I don't know why ZeptoLab wanted to introduce some differences for the other game "Cut The Rope". The NEW gameplay element introduced in this box is a "stream of scurrying ants" moving continuously in fixed patterns, different for each level. Drop the candy onto the ants' path and they’ll carry it along. The candy will be released when it reaches any ants' hole and to release it earlier, you simply tap on it. Android version is in the exact same place and same level.